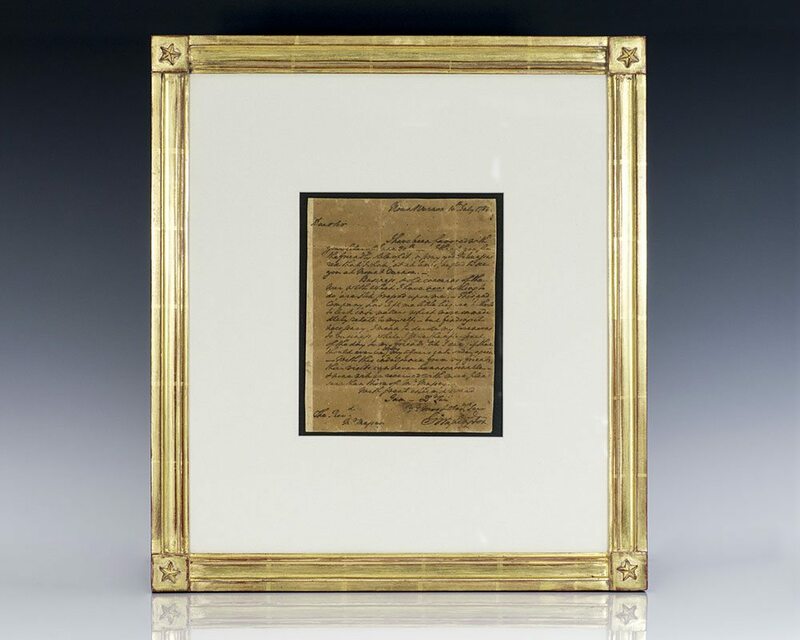 George Washington Autographed Letter Signed. 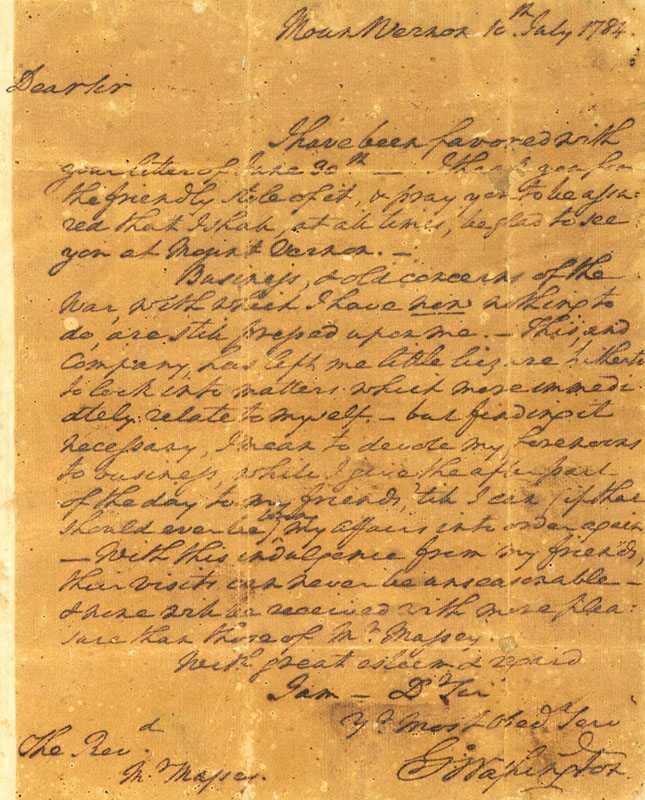 Autograph letter signed from George Washington all in his hand to the Reverend Lee Massey, dated July 10, 1784. It reads, “I have been favored with your letter of June 30th—I thank you for the friendly style of it, & pray you to be assured that I shall, at all times, be glad to see you at Mount Vernon. Business, & old concerns of the War, with which I have now nothing to do, are still pressed upon me. This, and Company, has left me little leizure hitherto to look into matters which more immediately relate to myself—but finding it necessary, I mean to devote my forenoons to business, while I give the after part of the day to my friends, ’till I can (if that should ever be) bring my affairs into order again—With this indulgence from my friends, their visits can never be unseasonable—& none will be received with more pleasure than those of Mr. Massey. 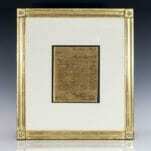 G Washington” In very good condition with toning from the old silk backing; the letter remains very bold and legible. The letter measures 7 inches by 9 inches. Matted and framed. The entire piece measures 16 inches by 18 inches. An exceptional piece of history written after the American Revolution as Washington looked to the future, little would he know that he would become the first President of the United States. George Washington and The Rev. Massey, who was Washington’s pastor, were two of the twenty-five signers of the Fairfax Resolves in 1774, which rejected the British Parliament's claim of supreme authority over the American colonies; these were among the most influential and radical resolutions passed in the early days of the Revolution. At the end of the Revolution on December 23, 1783, the heroic General Washington resigned his commission and returned home to Mount Vernon, determined to return to private life. The newborn nation still demanded his time, however, and he would re-enter public life in 1787 by leading the Constitutional Convention, before being elected president of the United States in 1789. The Writings of George Washington Being His Correspondence, Addresses, Messages, and Other Papers, Official and Private. Boston: American Stationers Company. John B. Russell, 1836-1837. 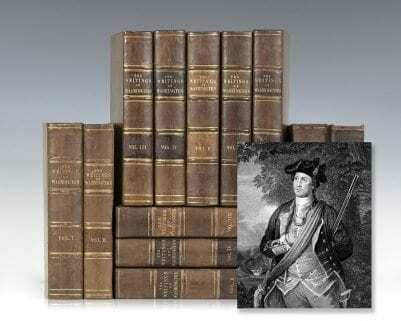 The complete writings of George Washington. 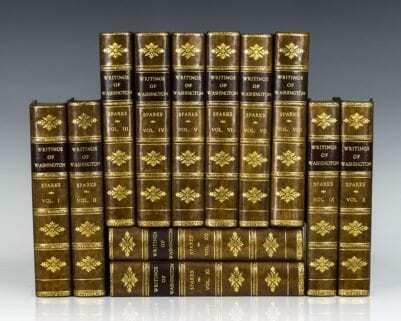 Large octavo, 12 volumes, uniformly bound in full contemporary calf, gilt titles and tooling to the spine, rebacked. Frontispiece of Washington to volumes 1-3; engraved by J.W. Paradise from a painting by J.G. Chapman after a painting by C.W. Peale; frontispiece in volumes 2 and three engraved by A.B. Durand, the first from a painting by Gilbert Stuart; frontispiece in volume 12 of Martha Washington engraved by J. Cheney. Editor Jared Sparks was a noted early American historian and President of Harvard College. Sparks worked as editor of the North American Review and a Unitarian pastor in Baltimore. His most notable work was his Writings of George Washington. An attractive set. George Washington: Sermons & Orations. Sammelband collection of thirteen sermons, orations and memorials addressed by some of the leading historical and clerical figures in mid-eighteenth century Boston, with particular focus on sermons preached on the occasion of the death of the first president of the United States, George Washington with his Last Testament and Will included. Contents include both printed text and hand-written script, including: The Last Will & Testament of General George Washington(1800), Extract of a Sermon Preach’d at the South Church in Boston by the Reverend Mr. Thomas Prince(1746), A Sermon Occasioned by the Death of George Washington by Samuel West, Pastor of the Church of in Hollis Street, Boston(1796), A Defence of the Legislature of Massachusetts or the Rights of New England Vindicated(1804), and An Oration of the Sublime Virtues of General George Washington(1800). Octavo, bound in full period calf, gilt titles to the spine, morocco spine label. Period bookplate from the library of William Peters Reeves, Westboro, Mass., Sept. 1908. In very good condition. An exceptional collection. Boston: Russell, Odiorne, and Metcalf, and Hilliard, Gray, and Co, 1834-37. The complete writings of George Washington. Octavo, 12 volumes, uniformly bound in full contemporary calf. Mixed early editions. Frontispiece of Washington to volumes 1-3; engraved by J.W. Paradise from a painting by J.G. Chapman after a painting by C.W. Peale; frontispiece in volumes 2 and 3 engraved by A.B. Durand, the first from a painting by Gilbert Stuart; frontispiece in volume 12 of Martha Washington engraved by J. Cheney. Editor Jared Sparks was a noted early American historian and President of Harvard College. Sparks worked as editor of the North American Review and a Unitarian pastor in Baltimore. Sparks’ most notable work was his Writings of George Washington. 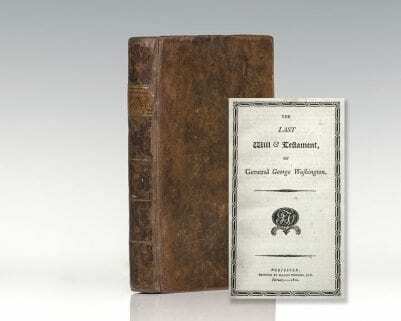 He was an important early American Antiquarian and influential in his historical scholarship on the new nation. Bookplate, in very good condition. Desirable set bound in full contemporary calf.